I’ve set some ambitious goals for the year, and it’s about time that I put them down in text so I can see how well I do, and maybe help me keep on track. One lofty goal that is a big question mark at this point is skiing from the summit of Gannett Peak, the highest point in Wyoming. This is a long trek at over 20 miles each way, but would be a blast. It’s likely that at least three days would be required, plus the 450+ mile drive just to get there. Rainier is of course on the list still, with exact route and date still undetermined. The plan has varied between Fuhrer Finger to Liberty Ridge to one of the standard routes, so who knows. I’d like to ski several of the more interesting 14ers this spring, and I’ve met some guys who are pretty ambitious as well so this should go well. Maroon is on the top of the list, and I’m looking forward to a descent of Longs and Torreys as well. I’ll be riding the century at Elephant Rock again which should be easy enough, and I’m thinking about doing another 100+ miler in the mountains as well. I intend to do at least four full-weekend backpacks over the summer, locations undetermined. Finally, I want to start looking seriously at a Himalayan trip. 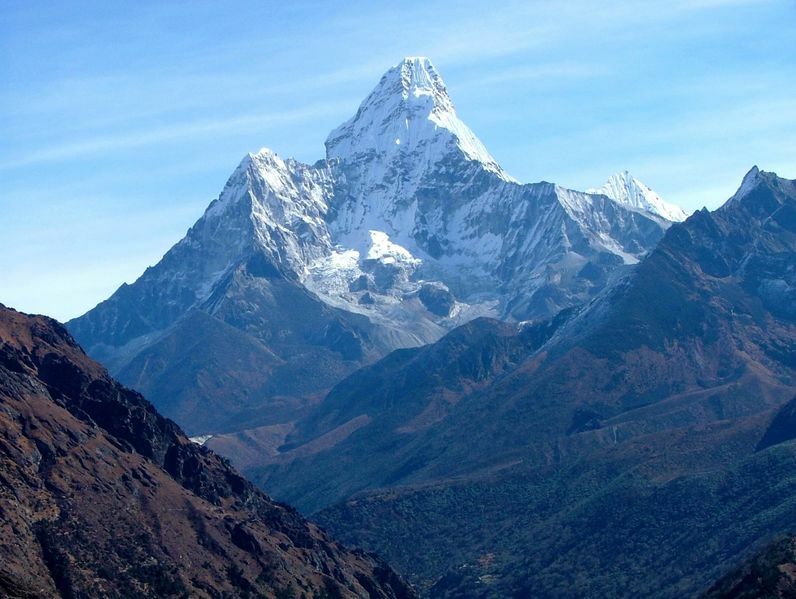 I won’t be going this year, but if I can get to Ama Dablam (6,856m) in 2010 rather than Denali, I’ll be beyond thrilled. Time is similar, cost isn’t that much more, and the payoff is far greater.